Our Abpromise guarantee covers the use of ab26138 in the following tested applications. WB Use a concentration of 1 µg/ml. Predicted molecular weight: 35 kDa. 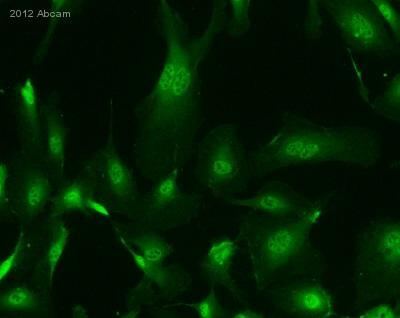 Good results were obtained when blocked with 5% non-fat dry milk in 0.05% PBS-T.
Immunofluorescence analysis of HUVEC cells, staining Hey L with ab26138. Cells were fixed with paraformaldehyde, permeabilized with 0.1% Triton X-100 and blocked with 1% BSA for 30 minutes at 25°C. Samples were incubated with primary antibody (1/200 in diluent) for 16 hours at 4°C. An AlexaFluor®488-conjugated goat anti-rabbit polyclonal IgG (1/500) was used as the secondary antibody. Publishing research using ab26138? Please let us know so that we can cite the reference in this datasheet. DESCRIPTION OF THE PROBLEM No staining.I used the antibody as the immunogen used (Human HeyL 1-50) was very close to the mouse HeyL protein which matched 49 of the aa. However it did not give any staining in the positive control (mouse E11.5 embryo section) with or without antigen retreival. I have seen that recently you have added two chicken anti HeyL antibodies which I would like to try though I am not sure if I should spend another $300 to get an antibody that does not work. SAMPLE Tissue PRIMARY ANTIBODY HeyL ab26138 Abcam DETECTION METHOD Immunofluorescence POSITIVE AND NEGATIVE CONTROLS USED Positive - Mouse E11.5 embryo section (worked in in situ hybridization) Negative - Secondary antibody control ANTIBODY STORAGE CONDITIONS -20 C (aliquots) FIXATION OF SAMPLE Paraformaldehyde ANTIGEN RETRIEVAL Heat mediated (sodium citrate) PERMEABILIZATION STEP 0.25% Triton X BLOCKING CONDITIONS 1% BSA with 0.25% Triton X 100, 10% NGS SECONDARY ANTIBODY Goat anti Rabbit IgG. Invitrogen Molecular Probes HOW MANY TIMES HAVE YOU TRIED THE APPLICATION? 2 HAVE YOU RUN A "NO PRIMARY" CONTROL? Yes DO YOU OBTAIN THE SAME RESULTS EVERY TIME? Yes WHAT STEPS HAVE YOU ALTERED? Antigen retrieval ADDITIONAL NOTES I used the antibody as the immunogen used (Human HeyL 1-50) was very close to the mouse HeyL protein which matched 49 of the aa. However it did not give any staining in the positive control (mouse E11.5 embryo section) with or without antigen retreival. I have seen that recently you have added two chicken anti HeyL antibodies which I would like to try though I am not sure if I should spend another $300 to get an antibody that does not work. Thank you for your enquiry. I am sorry to hear that you have been having difficulties with this antibody. Rabbit polyclonal to Hey L (ab26138) has been tested and shown to work in ELISA and western blotting. To date it has not been tested for its application in mouse. However, as you mention given the sequence similarity in the immunogen I would certainly predict reactivity in this species. Unfortunately we cannot guarantee this antibody to work for this purpose as it is yet to be tested. The antibody may be incapable of recognizing its epitope under these conditions. I would like to recommend that you leave some feedback of your experience with this antibody by navigating to the antibody datasheet and clicking on the "Abreviews" tab. For doing so you will be awarded with "Abpoints" that can be used to redeem discounts against future purchases. For further information please see www.abcam.com/abreviews.